Genoa warmly thanks Big River Inn (608-689-2652) for hosting this web site as a public service to the community. Our village lies on the banks of the Mississippi River, and is on the Great River Road. This beautiful, quiet village offers tranquil vistas and unique points of interest to visitors who like to get off the beaten path and into river village escapes. Thank you for visiting our Web site. Please visit us in person! What is happening in Genoa? We have answers to your questions on a variety of topics. Ask questions or give feedback. Web site policies are available. Thank you for your interest in Genoa! Genoa warmly thanks Big River Inn for posting this web site as a public service to the community. 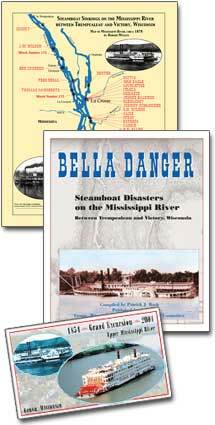 Purchase sunken steamboat booklets and posters through this web site, and commemorative post cards too! La Crosse and Prairie du Chien, Wisconsin. 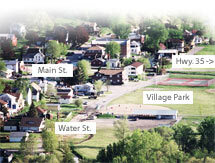 Genoa residents are especially proud of their Village Park on Water Street, just one block from Main Street. This community gathering green is home to many local events and recreational activities, and includes a shelter with full kitchen, baseball diamond, tennis court and putting green.